Taking a week off from competition in late June to prepare nearly an hour of music that we performed at a couple concerts and then coming back to edge out the Cavaliers at our home show. Lining up for the concert for Mrs. Hunt (benefactor of the corps), but turning around to play "Ave Maria" for a family who had just lost a child in a car accident. Watching audience members chat at the Alton, Ill., show while we got ready to play an encore and their heads just snapping forward when we hit the downbeat of "Entrance to Rome" from "Spartacus." The rehearsal field in Orlando being so muddy that when the horn line did a kick halt in the finale, a bunch of people ended up covered in mud. Dan Farrell's pep talk and the quiet intensity of rehearsal the morning after quarterfinals. Making the photographer wait while we sang "Ave Maria" after semifinals, which I think was our best show of the season. Brandt Crocker announcing that we had won the General Effect caption at finals and thinking, "Holy , we've got a shot." Taking pictures with the Blue Devils baritone section. Standing in front of the Blue Devils as they ripped through a West Coast warmup. Loudest. Ever. Seeing my buddy, Todd Dufault, running across the field to say hi as we were setting up for our victory performance. I have no idea how he snuck onto the field. 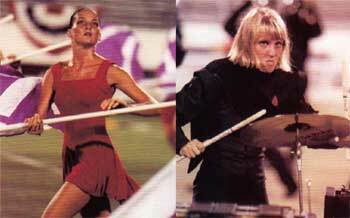 Thanks to everyone who voted for the 1996 Phantom Regiment. I can't wait to see it in the theater! Michael Oldemeyer played euphonium in the Phantom regiment in 1994 and 1996, and aged out in 1998.